If you own home, it can be a joyful thing for you but at times it can be a cause for worry. 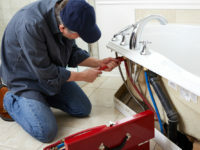 For many homeowners, the major cause of worry appears in the form of plumbing repairs, an occasion wherein ardent of do-it-yourself home repair enthusiasts will try to deal with it on their own. But the truth is that every problem cannot be fixed easily, especially if the problem takes more time than what the homeowner actually wants to spare. Under such circumstances, it is best to get in touch with a professional plumber in Manhattan. A homeowner may be daunted by the outlook for plumbing repairs, a professional plumber is well trained enough to meet such challenges every single day. They are well trained and skilled enough to pinpoint any plumbing problem without wasting much time and are aware of the complete layout of the plumbing system inside out. Plumbers can provide us with all types of plumbing services ranging from maintenance to emergency problems. There are many signs of the leak which are at times visible and invisible. The visible signs of a leak are due to the collection of water underneath a sink or a stain. The occurrence of invisible signs of leaks is due to the reason as leaky pipe has low water pressure towards the fixture or fixture is not working properly. Whatever the case be, there is need to get in touch with a plumber who can quickly and efficiently fix up the leaks. Generally, the term fixture repair means to repair or replace a malfunctioning fixture, be it a nozzle, showerhead or also a toilet. If you really want to replace it then is advisable that you take up professional assistance just to avoid any damage. Clogged drains—they are such a serious nuisance. Be it from bathroom to the kitchen, a clogged drain can always slow down the water flow, leaves unwanted residue behind, and is the major cause of all sorts of other problems. So, what’s the solution? You need to get in touch with a plumber who provides quality and fast plumbing services with effective results and makes sure to walk you through the issue that needs to be fixed. If any case you have any of the plumbing problems like leaks, clogged drains etc. that is causing trouble for you or restricting the flow of water in a sink or tub, call professionals for Plumbing Repairs in Manhattan, because at times the problem may be more extensive than you expect. Click here to contact us today!